I spent all of this last Thursday working on artwork, and here is one of the paintings I'm working on. I had these long canvases that my good friend Tom had given me when he graduated, and they had sat unused in the corner of my studio until now. 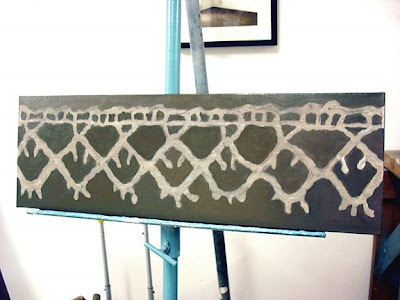 I have six of these, and I'm working on a piece that I want to run the length of a wall. I was getting a little crazy from too many tiny paintings. Anyways, this is just the start of the first one. I started to draw the lace just from looking at it, but I ended up having to take a picture of it to see the details for my drawing. I still had a hard time, I kept losing my place while trying to draw. Other than that, I am really having fun with this painting. The lace is the same lace from the last post -- the stuff at the very top center of the photograph. Teaching has also been going swimmingly this semester. I really love life drawing. There is nothing like drawing from a live model. It is challenging and exciting every day. 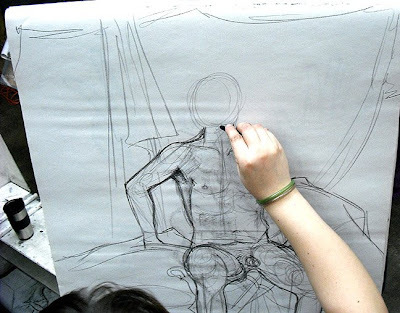 I loved taking figure drawing in undergrad, it helped SO much with my drawing skills. For most of my students, it is their first life drawing class. They are all making great progress, and I'd like to think they are all enjoying themselves - haha. If you would like to see more of what my class is up to, check out our Class Blog. I'm really loving using a blog for the class instead of handing out a bunch of forms and assignments. It keeps everything very organized and easy to reach. I'm hoping to put together a presentation for CAA next year that focuses on using blogging in the classroom, so the class blog has been a good test run for doing just that. Cassie, I LOVE your new painting. Girl what can you not do? I also really enjoy your bringing the blog-o-sphere to the classroom. I really love that idea, very relevant, and happy earth friendly!